The U.S Army marries Jupiter, the God of Gods. NASA provides the Wedding Party. 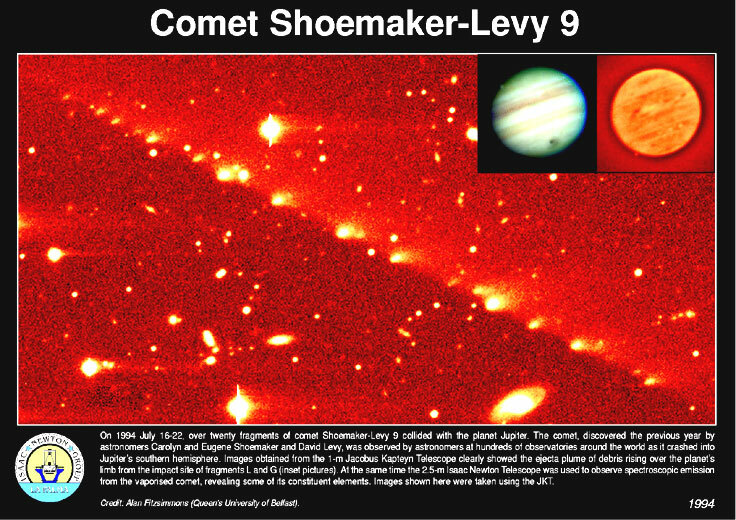 July 1994, the comet Shoemaker-Levy 9 crashed into the planet Jupiter. It was in March 1993, that astronomers discovered the strange celestial fairy made up of 24 aligned fragments traveling close to the biggest planet of our solar system. For over 15 months the scientific world observed the fragments, calculated with precision their collisions, and tried to imagine the effects and consequences of this encounter. Right from the start with the very first impacts, the observers were greatly surprised, indeed astonished, by the extent of the "cosmic show." 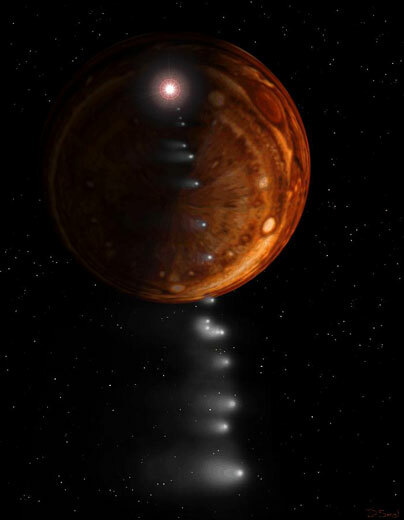 These "things" which exploded in the upper atmosphere of Jupiter from July 16 to 22, 1994, produced different visible or detectable effects such as giant fireballs, plumes that rose to an altitude of 3300 kilometers, debris fall-out which created gigantic dark stains reaching the enormity of FOUR TIMES THE SIZE OF THE EARTH, all this, as well as the effects in the infrared, ultraviolet, x-rays, and other observations less spectacular but by no means less important. Scientists, having spent months dissecting all this information, haven't yet found explanations or models complete enough to include all the data. Seen from this point of view, it truly does look like a miracle. Yet miracles are rare, and they often have an explanation. Let us look at this one through another aspect of its reality: this cosmic event that we witnessed live, is nothing other than a large scale test of the latest superpower bombs of the U.S. military, launched into space by NASA and skillfully camouflaged as a cometary collision. Far-fetched? Not exactly. Let us explore this idea further. To understand this, we must go back in time to the period when the Cold War was at its height, to the period when in the two "Superpower" countries, insane ideas were ripening, ideas of terrifying arms that would enable one country to take decisive advantage over the other. Very little time before, physicists had just conceived of and perfected the nuclear fission bomb in the dramatic context of World War II. August 1945, in Hiroshima and then in Nagasaki, humanity took a decisive step forward into the utilization of a colossal force of destruction. This step forward kicked the door open in the United States, the Soviet Union, Great Britain, France and then in China to the development of the nuclear fission weapon, as well as the installation of its "big sister" of fusion: the H-bomb, known as thermonuclear. In the Sixties, while our world hadn't yet understood or even discovered the climactic phenomenon "nuclear winter" that would inexorably decimate the survivors of an atomic conflict and put an end to our earthly civilization, military laboratories were preparing the next step in great secrecy. The U.S. military program, classified as the Defense Support Program 32 (DSP 32), explored a route totally different from that of particle accelerators, a route which allowed them to obtain a more ultimate form of energy: antimatter, ten thousand times more powerful than nuclear fission. Laboratories in the Western United States oriented their research towards very high densities within the framework of hydrogen fusion mastery. In their high density experiments, laser power is indicated by terawatts (a trillion watts), and pressure, by millions of atmospheres. The DSP 32 program also secretly worked towards a goal different from hydrogen fusion. A certain number of physical parameters had to be pushed further in order to exceed the fantastic pressure of one hundred million atmospheres to reach the threshold where the balance of matter is broken, a threshold where some of its characteristics inverse: this is antimatter. In order to obtain this fateful pressure, a sophisticated technology is necessary; the gigantic lasers at that time, even those of x-rays, weren't yet powerful enough. It was in reworking certain ideas of Andrei Sakharov, the Soviet Nobel Prize winner, that the first successes took place. During the Fifties, Sakharov, known as the father of the Soviet H-bomb (before he became a militant for peace), perfected an electromagnetic cannon system which, in compressing a solenoid with the help of an explosive, enabled him to obtain a magnetic pressure of twenty-five million atmospheres, that which transformed a mini-charge of aluminum into plasma and ejected it at dizzying speeds of hundreds of kilometers per second. This system was therefore improved; the standard solenoid was replaced by a solenoid supraconductor, and the conventional explosive, by a small atomic charge, facilitating the attainment of the necessary pressure threshold. The target, instantly transformed into plasma, is ejected into a chimney where the particles of antimatter thus obtained, are sorted electromagnetically and gathered into a "magnetic bottle." LAURENCE LIVERMORE, SANDIA, LOS ALAMOS, NEVADA are among the many places which participated in this epic, each in its own way, sometimes under the cover of the experimental program: Centurion-Halite, the official program of research on the mastery of the fusion of hydrogen, but which also served as a cover when the experiments employed atomic explosives. In the East the same research was actively and swiftly carried out, and if recently the technology suffered from a certain deficit, the ideas were often more advanced. During the decade of the Eighties, a little bald-headed man arrived at top of the government in Moscow. Conscious of the ultimate slope of world progress, he rapidly eased a great number of international tensions, efficiently restarted negotiations on disarmament, and actively cleaned house in his own country by scratching a certain number of advanced military research projects. In the West, well hidden behind a shiny facade of peace defending, several "Doctor Strangeloves" were acting as ruthlessly as ever. Since their arms race had received a bullet in its wing, they learned to do without simply by thinking up a more diabolical ideas: experimenting with antimatter bombs on a large scale level, bombs which are thousands of times more powerful than any created up to this point. With the earth being too restricted geographically and strategically for this type of project, our "doctors" turned towards outer space and... the planet Jupiter. It is obvious that such a project could neither be done in one day nor in broad daylight. For, on the one hand, the plan was to keep the technology secret, and on the other hand, according to the Space Laws (U.N. treaty of 1967, namely article 4), military experiments as well as the deployment of massive destructive arms into space are prohibited. But when the ambition to be masters of the world is strong enough, laws, even international ones, are just scarecrows to hide judiciously behind. The realization of this project necessitated, therefore, a regrouping of a certain number of material elements, and the adoption of an ingenious and rigorous dissimulation strategy, both by technological contributions as well as by the preparation and manipulation of opinion. Let us look at some of these means. August 16, 1984, the 175th Delta rocket, carrier of the Active Magnetospheric Particle Tracer Explorer (AMPTE) program, was launched from Cape Canaveral. The mission consisted of 3 small satellites which, over the course of one year, were first meant to release several "clouds" of barium and lithium at different points in intra and extra-magnetospheric space, and then to observe the evolution of the element tracer ions in order to study the interactions of solar wind with our magnetosphere. The material realization of this experiment was the result of the collaboration of several laboratories situated in three different countries (U.S.A., Federal Republic of Germany, United Kingdom of Britain). The research goal of some was to study for an improved understanding of the earth's environment; the unconfessed goal of others was to experiment in real conditions the creation of cometary phenomenon in order to observe its evolution over time as well as in diverse spatial conditions. Under the action of the sun's rays, the barium and lithium are rapidly ionized and have the characteristic of becoming fluorescent, creating, therefore, an artificial comet. 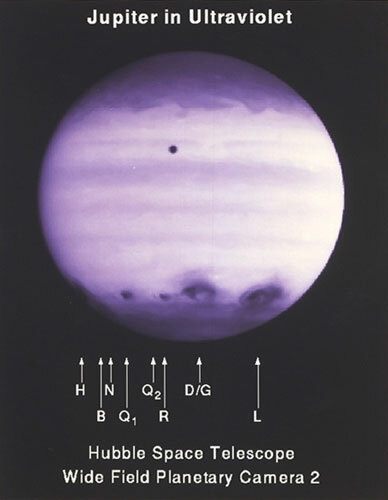 The AMPTE program was one of the stages of preparation for the "Jupiter Project," one of the steps towards the perfection of the camouflage system by a cloud of particles of an alloy of barium-lithium. "Then I came across this very strange-looking object. I thought it had to be a comet, but it was the strangest comet I had ever seen, (see below enclosed report)" (2) said Carolyn Shoemaker, recounting the night of March 24, 1993, at the Mont Palomar Observatory (California), where she was the first to observe the phenomenon which afterward would be called: the "periodic comet Shoemaker-Levy 9" or said more simply, "SL9." Carolyn Shoemaker was no doubt far from imagining that she had just discovered the luminous barium-lithium clouds, those which were generated by the module-bombs. The size of their clouds were adapted to the presumed force of the corresponding bomb. In certain cases the modules were grouped by two's and were able either to separate one from the other ("fragments" P and Q) or stay close together ("fragments" G and K), the latter which provoked explosions spaced apart by a few minutes where the phases were overlapping, the forces and epicenters slightly different in longitude, latitude or altitude. The "SL9" modules were placed on a very eccentric jovian orbit over a 2-year period. This orbit, an oval shape stretched to the extreme, has the following characteristics: at one of its extremities (periastre), it passes at a distance from the mass center of Jupiter which is less than the radius of the planet itself, hence, it faces an unavoidable collision; at the other extremity (apoastre), it brushes the limit of the gravitational attraction zone of Jupiter. If "SL9" had had a slightly faster speed, it would have left Jupiter's influence and continued its route on a solar orbit. In observing this trajectory, we rapidly notice that there is no better choice of orbital plan if one wishes to spend time far from Jupiter to have the greatest chance to be spotted and then to come back and strike the planet. 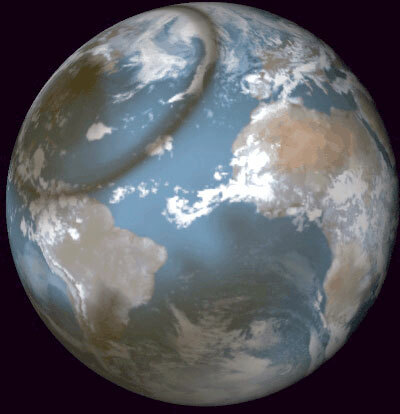 As far as the other parameters go, parameters which conditioned the impact sites, they were calculated so that the collisions took place on the back side of the planet, invisible from Earth. This was an indispensable precaution, as these explosions look exactly like nuclear explosions with powerful emissions of electromagnetic rays, primarily gamma rays, which would have fatally given away their questionable nature. However, even though no observer on Earth could directly see the events, moving in the obscurity of cold space at more than 11 kilometers per second, an eye was observing. It was in 1973, the period just after the glorious Apollo missions that the Galileo project was born, even though it didn't take its real first breath until 1977. This program of advanced exploration of Jupiter and its environment, experienced a certain number of difficulties and several launch delays. The departure finally took place October 8, 1989, and because its two-stage solid-fuel rocket was not powerful enough to take the direct route (a launcher restriction, due to the new security norms aboard the Space Shuttle), the spacecraft Galileo took the long way in order to benefit from several gravitational reactions (Venus and twice around Earth), finally reaching Jupiter in December 1995, at the end of a voyage of a record duration, more than 6 years. Curiously, while the impacts of "SL9" were on the hidden side of Jupiter, slightly beyond the planet's limb, Galileo was at that moment in direct view of the event. Was it just by chance, or by judicious programming that Galileo was the only ocular testimony, looking innocently like a simple and fortunate coincidence? This spacecraft, loaded with cameras and multiple sophisticated detectors, was confronted right from the start with several technical problems: the large antenna, the registering tape, the probe parachute, etc. It is important to discern between the real technical problems and the strategic breakdowns which would offer an excellent pretext to occult a part of the information:=0B- delay of 50 seconds in the opening of the atmospheric probe's parachute which would mask the composition of the first kilometers of the jovien atmosphere, just at the altitude where the explosions seemed to have taken place. As for the rest of the jovian mission, the possibility that the collected information be seriously skimmed and filtered before it was divulged, is more than just a simple hypothesis. Many scientists were astonished by certain gaps in information on the "SL9" observations. It is quite troubling that Galileo only filmed the relatively modest effects of the "SL9" impacts, when the astronomers based on Earth, even though they were five times farther away and not as well-placed, observed the grandiose effects which at times saturated the detectors. In the press there appeared a certain number of articles written by persons working at the laboratories directly implicated in the realization of these events. 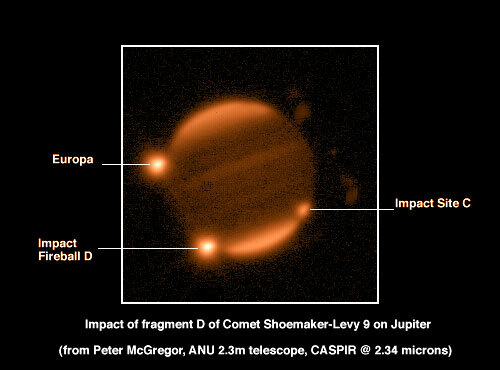 Of course these articles on "SL9" developed hypotheses, studies, and theories on the fragmentation, the evolution and the phenomena of the impacts of the "periodic comet captured by Jupiter." Among the persons directly implicated in the program, there were certain who actively participated, like worms in the apple, at numerous scientific meetings pre- and post-impacts. In 1993, the American Department of Energy was appointed to study ways of maintaining a safe stockpile of nuclear weapons in an era of "arms reduction." Hence, the Stockpile Stewardship and Management Program came into being. The tone of the program report exhibits a spirit of democracy, the respect of the international arms reduction agreements, the concern for national security, and the upheld ideal of "transparence." But as many people or groups imbibed with power use language to their advantage, the text manipulates lies perfectly to hide the reality. Throughout the report we can read that the U.S. no longer tests nor does it produce new weapons! This project is not, strictly speaking, an element in the realization of "SL9." Its questionable goal is to open certain frightening possibilities for the future. This program which was submitted to the U.S Congress in 1992, was proposed under the theme of insuring the safety of our planet which faces the risk of a cosmic collision with asteroids and comets that might come too close to the earth's orbit. This project consists of the construction, the installation and the maintenance of 6 earth-based telescopes. Certain defenders of the program attempted to open the way to the utilization of nuclear weapons in space in order to destroy or deviate these hypothetical bolides. Fortunately, the opinion of certain scientists was voiced in order to relativize the dangers, that is, the minor probability of a collision with the earth versus the major risk of the manipulation and the deployment of such weapons (either known or secret). One must note the particular way the presentation of the project was inscribed into a bigger scenario. The program, not being accepted the first time around, witnessed a revival of interest as the "collisions of SL9" hit the scene to incite new fears, permitting, therefore, its reconsideration, this time much more favorable. Is this event the first and only experimentation of such bombs? Given that this technology appeared in the Seventies, would the U.S. military have waited 20 years to test it? The observation of a certain number of cosmic events prove that the answer is no. There is a specific category of comets which have the distinctive feature of grazing or even striking the sun. This "Kreutz Group," as it is called, is made up of over 30 observations, the oldest dating from the year 371 B.C. What is interesting is that more than half of this group is composed of a wave of 16 mini-comets carrying the names of "SOLWIND" and "SMM," the two artificial satellites which observed them from a terrestrial orbit. This curious wave which took place from 1979 to 1989, is not without a strange similarity to "SL9," as all of them disintegrated in an explosive manner. The two military satellites were there, supposedly, to study the sun and its magnetic storms; in reality, their more specific role was to observe the performance of these 16 experimental projectiles in their final phase. The Kreutz Group comets which were spotted before had, for the most part, orbits inclined approximately 144 degrees. Therefore to insure the camouflage of these 16 bombs, it was necessary to have them approach the sun following the same incline. The 16 projectiles were not surrounded by a luminous halo of barium-lithium as was "SL9"; thus, they were not visible in advance. It was only in their final phase of approach to the sun while they were plunging under the effect of the powerful solar gravity at speeds of 300 to 400 kilometers per second (or more than a million kilometers per hour), leaving behind them a luminous trail due to the heating up of the thermic shield, that they were able to be recorded by telescope-coronographs of the U.S. Military satellites. The strong luminosity of the solar disk obviously didn't permit a direct observation of the explosions; only the illumination of the solar corona was observable by the coronographs during several hours after the impacts. But all astronautic specialists will tell us: with the space launchers we have now, it is absolutely impossible to send a sizable payload towards the sun. This indeed would require an acceleration of over 50 kilometers per second, that is, much more than it took to send the spacecraft Galileo towards Jupiter. Galileo, weighing only 2200 Kg, couldn't benefit from a launcher adequate enough to provide the minimum acceleration necessary to leave directly towards its objective (6400 meters per second was needed, starting from the terrestrial orbit), and thus was restricted to take a long, complex route. So how did they do it? Let us begin to answer this question by looking at a bit of elementary mathematics. It is of course the rocket engine thrust force that engenders the acceleration. The thrust is calculated by a very simple equation: it is the product of the ejection speed of the gas (at the propulsion-nozzle level) by the mass of the gas ejected, that is, the mass of the propergol withdrawn from the reservoirs. Since the beginning of the space era, propulsion technology has improved in dependability, but it has hardly evolved in performance, as it constantly runs up against the physical limit of the chemical combustion engine's gas ejection speeds which vary from 2.5 to 4.5 kilometers per second, according to the propergol used. This limit restricts, therefore, the loading of enormous quantities of fuel used to augment the capacity of the launcher (2000 tons at liftoff for the Space Shuttle and close to 3000 tons for the Saturn V rocket); hence, a certain amount of research is done on other types of propulsors with heightened ejection speeds. These new propulsors allow for the diminution of fuel masses, and at the same time offer an augmentation in payload and performance. In the field of space propulsion as well as antimatter (the two are in fact intimately linked), it is time to understand that we are faced with two realities, two levels of technology. the other, with high performances, is kept an ultra-secret and is reserved for occulted military use. During the Seventies, in the laboratories of Sandia (New Mexico), a new type of propulsor was perfected which, right from the first utilizations in space, accelerated ionized gas electromagnetically at close to 100 kilometers per second, indeed, a jump by a factor of 20 in comparison with performances of the best chemical combustion engines. In the standard technique, the propergol ensure both the supply of ejected material in the form of residual gas from the combustion, and the stock of energy in the form of an exothermic chemical reaction (combustion), which accelerates the gases. The new technology is, of course, very different and much more complex. The material ejected, an isotope of silicon, doesn't undergo chemical modifications, rather, it is simply accelerated by powerful magnetic fields after having been vaporized and ionized. The source of energy of these propulsors is antimatter, itself which, by an astute autoregulatory system, produces the electricity necessary for the propulsion as well as for its proper confinement. Admittedly our study does not have the means to reveal the details of this top-secret knowledge. All the same, it could be interesting to reflect on it, namely in remembering that the interaction of the gamma rays with a material produces powerful electromagnetic effects (effect EMP). That all this was thought up incognito and realized in an ultra-light system - a compact system perfectly adapted to spatial navigation - may seem incredible. Certain readers will be tempted to say impossible. However, the wisdom of science doesn't ask us to believe in the existence of things, not more than it obliges us to believe in their non-existence. It pushes us to study, to verify; it urges us to open our eyes. In order to stay undercover, this new technology was obviously not used in the first phase of launching, that is, the phase which went from lift-off to satellization in an terrestrial orbit. For this step standard launchers were used, principally the Space Shuttle and its classified military missions. The experiments with the sun began in the advent of the Space Shuttle; therefore, it was the launcher TITAN that was used. TITAN rockets, which are for the most part reserved for military usage, had already at that time in the version III, and then 34D, a capacity to put 14 to 18 tons into a low terrestrial orbit. For the missions to the sun, the TITAN rocket put into orbit a payload containing one module-bomb which was placed inside the last stage of the rocket. It is this stage, equipped with an antimatter propulsor, that insured the departure from the earth orbit towards its objective. Over the course of the 1980's, it was the Space Shuttle that was most often used (but not exclusively). The first three military missions - January 24, 1985, October 3, 1985 and December 2, 1988 - had this destination. There was one additional mission that had the same target: the second test flight of Columbia, November 12, 1981. It is true that it wouldn't have been "clean" to put a military mission right at the start of the Shuttle program; it was much easier, therefore, to place it discreetly into one of the four test flights. The November 12th mission of Columbia holds the record for the heaviest take-off weight of all the unclassified shuttle launches, hence, it was necessary to conciliate its covered-up objective with the material needed for the announced objective, that is to test fly the Space Shuttle. During these missions, the same rocket stage that was previously used with the Titan launchers, was placed in the Shuttle's payload bay. However, this time it contained not one, but two module-bombs, as the Shuttle's payload capacity is 30 tons, which is double that of Titan rockets. In astronautics, when high-performance equipment is available and the amount of time to fulfill an objective isn't restricted, there are often a whole range of trajectory possibilities. If also the goal is not to be spotted, the voyage routes and times need to be varied. Hence, there are no correlations between the launch dates and the observations of the SOLWIND and SMM comets. Nevertheless, there is a common element in the chosen trajectories: a passage by the outskirts of the planet Mercury. Of course it was not a direct meeting which would have been too visible for certain observers, but rather a deferred encounter, a bit like the spacecraft Magellan, launched in 1989, which reached Venus after a journey of 15 months and one and a half orbits around the sun. It is interesting in this optic to observe the reciprocal positions of Earth and Mercury at the time of each mission: November 12, 1981 and January 24, 1985, on the one hand, as well as October 3, 1985 and December 2, 1988, on the other. Having reached a certain point of the voyage, the module-bomb left the stage rocket where it was housed. The module which had a short cylindrical form like a large tuna can, was equipped with a small propulsor, the nozzle placed on the circle's circumference, allowing it to move laterally. The module once liberated, traveled towards its final objective: the Sun. If two modules were aboard the stage rocket, the second one stayed an additional amount of time inside its carrying vessel in a "parking" orbit before taking flight. and finally November 24, 1991 (Atlantis). Each Shuttle carried in its payload bay a long cylindrical cargo spacecraft equipped with a large propulsor in the back. Since the first launches towards the sun, 10 years had passed, and the technology had greatly miniaturized, allowing for a greater number of bombs to be carried at each mission. The 6 cargo vessels didn't all have the same size: 4 of the vessels contained 3 module-bombs each; the 2 others, being much larger held 6. This means there were a total of 24 bombs. The smaller vessels were conceived to ensure that if problems occurred with the Shuttle fleet, the vessel could be launched by the TITAN IV. Each cargo vessel individually took the route to Jupiter, following a trajectory adapted according to the position of the earth at the moment of the launch and the time it had to reach its destination. 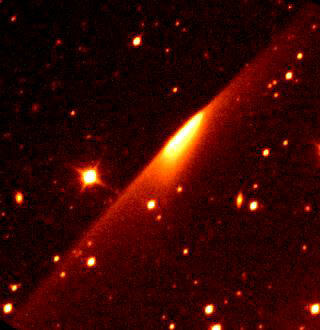 It is important to remember that the "comet SL9" was discovered March 23, 1993; however, in examining older snapshots, it was also photographed March 15, 1993. 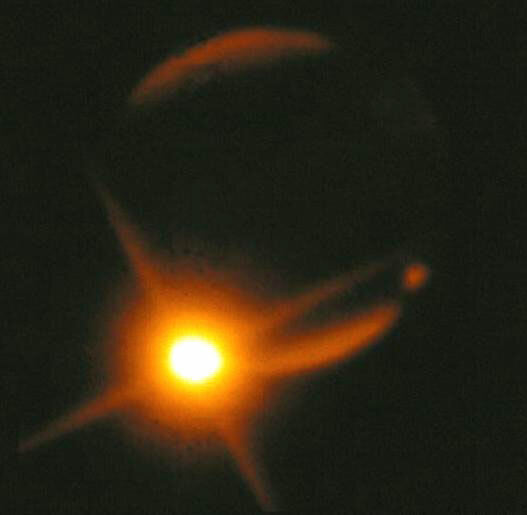 But curiously before this date, nothing had been observed even though this "SL9" was supposed to have fragmented in proximity to Jupiter in July 1992, and also was supposed to have traveled on this orbit with its dust clouds for 8 months, having theoretically journeyed more than 40 million kilometers. It must be made clear that this space convoy never passed in proximity to Jupiter in July 1992, but rather around March 1, 1993, it directly joined a point in this jovian orbit very close to where it was discovered. Thus, the last cargo vessel which left Earth November 24, 1991, made the trip to Jupiter in hardly more than 15 months. At the departure from the earth's orbit, it had to create an additional acceleration of about 8400 meters per second, then in arriving at its objective it needed to accelerate again (actually a breaking) this time around 15,000 meters per second. If we want to compare the performances of the two types of space propulsion, we must note that in 1979, one of the space probes "Voyager" realized the trip Earth-Jupiter in almost the same time (18 months), but only the first acceleration at the departure was necessary. For in passing the neighborhood of Jupiter, the spacecraft maintained its speed in order to continue its route towards Saturn. What's more, Voyager was actually a feather (800 kg) next to the cargo vessels of "SL9" which weighed 15 to 30 tons. After voyaging solo, the 6 cargo vessels met at around 40 million kilometers from Jupiter. There they were aligned on the known orbit of "SL9", the payload doors were opened and the module-bombs were mechanically ejected. Once their cargo was discharged, the vessels fell away from the trajectory and auto-destructed by explosion. The fine positioning of each module-bomb on the jovian orbit was achieved by trajectory corrections with the aid of a small propulsor engine. Once on the orbit, the camouflage system was activated: the barium-lithium was heated, liquefied, then vaporized out of the module. In cold space it resolidified into very small particles which the sun's rays rapidly ionized. A powerful magnetic field outside the module, created by antimatter energy and supraconductor technology, was put into effect which trapped and conserved most of the ionized particle cloud. In the jovian approach phase, when the modules crossed into the magnetosphere of the planet, the interaction of the two magnetic fields made the modules progressively lose the outer layer of the particle cloud leaving only the central core, the densest part, closest to the bombs. These 24 modules, even though globally conceived around the same principle, differed in size, explosive power and technology. It was the module/"fragment" K which evoked the strongest interaction with the planet's magnetosphere, creating powerful particle accelerations of ions and electrons, found there. These particles which traveled rapidly along the lines of the jovian magnetic field, produced x-ray emissions in Jupiter's atmosphere even before the impact. 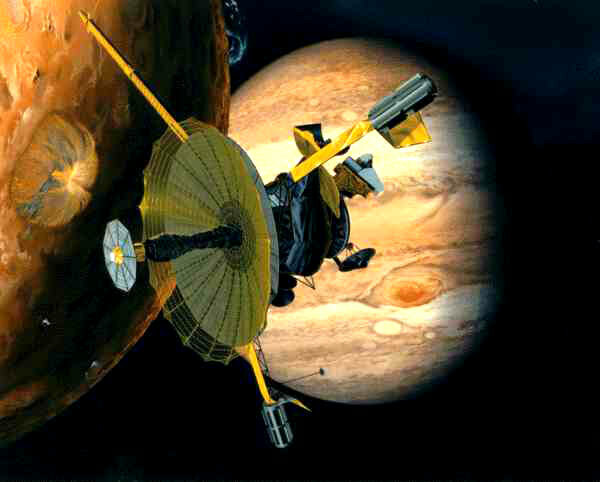 We remember that in December 1995, Galileo's probe plunged into the jovian atmosphere with a relative speed nearly equal to that of "SL9" (50 kilometers per second, Galileo; 60 kilometers per second, "SL9"). The probe was equipped with a highly efficient thermic shield made to resist the intense heat provoked by its entry into the atmosphere; the "SL9" modules didn't use this sort of thermic shield. It would be very interesting if the promoters of this operation explained the technology that was used at this precise moment of the mission, given the fundamental importance of this knowledge. When this information is in better hands at the service of nobler objectives, Man's voice from the moon can once again proclaim: "One giant leap for mankind." It was hardly more than a century after the famous novel of Jules Verne, "From Earth to the Moon," that two men walked on the lunar soil for the first time. At the memory of the glorious expedition of Apollo XI, the world still pulses with emotion. This great event was lived by the majority of people as a true advance of human civilization which, beyond the technological exploit, made us aware that humankind is not irremediably attached to planet Earth, thus opening the way one day to voyage further in the universe. The famous words spoken by Neil Armstrong on this occasion symbolized the immense hope of peace and world cooperation that was placed in the space program. Without a doubt this noble et legitimate hope is only one more illusion that we must confront. The enormous Saturn V rocket, carrier of the Apollo XI mission took off on July 16, 1969. Neil Armstrong and Edwin Aldrin aboard the lunar module stayed on the Moon July 21st and, after having joined Michael Collins, left the lunar suburbs July 22. The first impact of "SL9" took place July 16, 1994; the bombardment of Jupiter continued until July 22. By this very particular manner of celebrating the 25th anniversary of Apollo XI, the American military-spatial lobby shows us its real objectives when it comes to the mastery and the utilization of space. It is undeniable and fortunate that space launches have improved in reliability since their beginning. It is nevertheless true that tragic accidents still happen, because in fact no technology is absolutely sheltered from accident. We remember in 1996, the spectacular failure of the first test launch of the European Ariane V, a rocket designed with the idea of dependability. Also in 1996, there was the tragic accident of the Chinese rocket which took the lives of many innocent victims. But it is certainly the Space Shuttle Challenger disaster on January 28, 1986, which marked the memory of those in the Western world. That day, the 25th Shuttle flight, Challenger and the seven crew members were lost in a violent explosion under the aghast gaze of millions of onlookers and television spectators. In the instants that followed, the smoke trails left a swan in the sky. We have seen that numerous times Titan rockets and Space Shuttle have transported superpower antimatter bombs as well as military engines functioning with this energy. Who would dare imagine what would have happened if one of the flights had witnessed a fatal failure? During the course of the 1980's several teams of scientists carried out rigorous studies on the consequences of a nuclear conflict. (3) The climactic modifications which the explosions would have engendered from such an event would have had as consequences, in very little time, besides the countless victims directly hit, the disintegration of our civilization, if not the pure and simple extinction of humanity as well as the major part of the plant and animal kingdoms. Each one of us can form a personal idea of the risks taken by the fabrication and the manipulation of antimatter. For it is important to understand that contrary to the nuclear bomb that only explodes when one activates the firing system, antimatter, once created, MUST BE CONFINED ACTIVELY AND PERMANENTLY by magnetic fields in order to keep it from entering into contact with matter in which case it explodes. One must also know that each one of the bombs fabricated, possesses a force equal and often superior to the entire world-wide nuclear power! What would happen if an incident occurred during a manipulation over the Western American states or if a Space Shuttle or another bomb-carrying rocket had an accident? Right from the beginning minutes, all life on the North American continent would be annihilated by an enormous fireball that would cover several thousands of kilometers. Then would come the shock wave, the intense heat and the electromagnetic waves that would continue their devastating effects over a much vaster area. Finally the phenomenon "nuclear winter" would spread rapidly over the totality of the planet, and Earth would lose herself in an almost total obscurity and a glacial cold. One can read in diverse literature and even in the Bible, of dark prophecies of an apocalypse for a period which highly resembles ours. Yet nothing is ineluctable. But are we willing to see; are we willing to accept our responsibilities; will we have the courage to say NO to destructive insanity? Mister President of our beautiful France, will your little firecracker of the Southern Islands finally be ready? Will it at last be perfected in order to give to the day of the big saga, a modest but 100 percent French touch, bringing in "a certain image of France," an image dear to the heart of the French? By the events of Mururoa (Tahiti), you knew with authority how to get yourself recognized by the whole world; that subtitle and last little touch could perhaps in the future allow you to inscribe for good your name (in small letters at the end of the list) in the cold gloom of posterity. At the term of this study, many will be the assiduous observers of spatial activity, who, after having added everything up, will ask the question: "But the last military mission of the Space Shuttle (December 2, 1992), where did it go?" If we had the means we could of course cover every planet in the solar system with "wanted" posters. Since that possibility is not feasible, we are, therefore, constrained to work our brains in an attempt to discover a logic behind the destination. We have seen that the first 16 bombs left for the sun and exploded in or at the approach to the solar corona; the intense luminosity of the sun hardly permitted a precise observation of the effects. The sun, at least in its periphery, is a hot and gaseous star. The next 24 bombs went towards Jupiter, and the observations of the effects this time were clearly much easier. 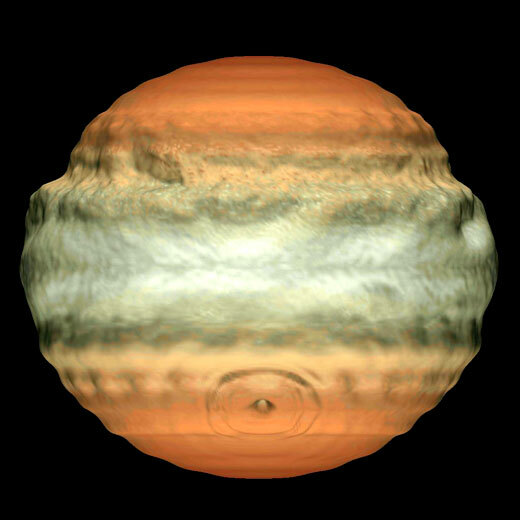 Jupiter is a cold and gaseous planet. It seems logical, therefore, to think that our investigators would have had the desire and the curiosity to experiment with their bombs on a planet not gaseous, but telluric, that is, a rocky planet like Earth or the Moon. The planet of course must be relatively far from the earth which excludes a priori: the Moon, Mars, Venus and Mercury. It is also necessary that there be a way to observe the explosions, that is, to have an on-site observer. At the moment it is the satellites of Jupiter which correspond to these conditions, with the spacecraft Galileo which is in place for a close observation. What's more, if we put this deduction next to the curious breakdown of Galileo's recorder when it passed Io and Europa in December 1995 - a breakdown which officially deprived us of close-up images of these two satellites, images which perhaps wouldn't be judicious if we compared them with other images in the future - one could reasonably be frightened for one or the other of the jovian satellites. According to the laws of astronomy about every 13 months, the system of Jupiter is found diametrically opposed to the earth, in relation to the sun. This means for an observer based on Earth, the solar luminosity inhibits all observation of the giant planet and its satellites. In 1997, this conjunction takes place the end of January. Wouldn't these be ideal conditions for camouflage? For a couple of years we have witnessed a media campaign to heighten public awareness on the observation and study of impact craters and chains of craters on different bodies in the solar system; scientific interest or ultimate strategy of mind preparation? In a couple of weeks Jupiter and its satellites will once again be observable. Astronomer friends grab your telescopes! Destructive insanity, which includes power and hate, fear and terror, is brought to its height in a certain number of individuals or groups of individuals around the world. It is also true that a great number of aspects of this insanity are more or less present in each one of us, just as it is true that the desire for peace, the desire for sharing, the desire for harmonious balance (do we dare say the seeds of love), are also present in each one of us. To position oneself in one or the other of these directions is a choice entirely personal and individual. At the planet level the sum of the all the individual choices is none other than the collective conscious of Humanity and... ITS DESTINY. 1 - "Nature," June 1, 1995. 3 - Among many texts: "A Path Where no Man Thought," Carl Sagan and Richard Turco.